Airborne wind energy systems (AWES) are seeing growing wind industry interest, but it remains an emerging technology set against conventional wind power’s track record, production volumes and readiness for market. But its fundamental benefit of eliminating the need for foundations and towers, and their associated costs, means AWES deployment could become an economically viable alternative for conventional wind installations, onshore and offshore, especially at locations otherwise considered unfit for wind-power generation. Ampyx Power’s business focus on far-offshore, deep-water applications is reflected by its recent Sea-Air-Farm feasibility study. This project concentrates on the largest prototype now being built — the 150kW twin-body AP3 model with a 12-metre wingspan — scaled up to a future 2MW AP4 with a 36-metre wingspan. The AP3 prototype was designed primarily to demonstrate safety and automatic operation of the system. With the AP4, the emphasis shifts to optimising power generation and an offshore-dedicated application. The consortium behind the study included the Energy Research Centre (ECN), the Maritime Research Institute (Marin) and marine engineering consultancy Mocean Offshore, all based in the Netherlands, as is Ampyx. Their joint analysis involved offshore application of a single floating AWES, and allocating opportunities and limitations for a reference 350MW far-offshore, deep-water airborne wind project with AP4 systems. ECN validated the aerodynamic tools, modelled installations and O&M scenarios, and calculated yields and costs. Mocean Offshore designed the floating platform that was tested in Marin’s wave-wind basin. 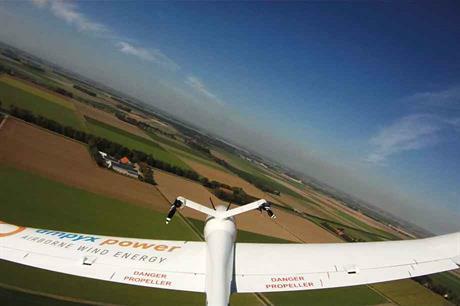 Ampyx Power designed the AP4 aircraft concept and wind farm, studied the certification framework and managed the project. According to van Hemert, the study indicated that future multi-megawatt AWES units could be deployed in large-scale projects using small, anchored floating platforms. Model simulations further showed that the wake effects of AP4 aircraft amounted to 1% wake losses in a project using 600-metre internal spacing. This is less than for conventional offshore turbines, he says. 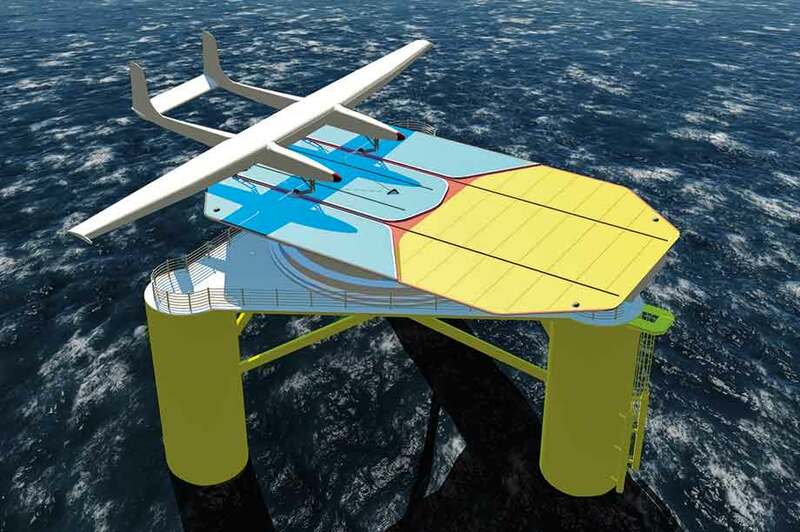 An interesting alternative option is to use existing substructures from projects using 2MW turbines when they reach the end of their operating lifetimes (usually 20 years), for fixed-bottom landing platforms. "Such early wind farms could become available for repowering within a few years," says van Hemert. "Because our landing platform adds only a little mass to the structure compared to the original turbine mass, plus loads, extra fatigue loading is hardly an issue. "The electrical infrastructure is designed to last around 40-50 years, but there are other economic and social issues linked to postponing decommissioning and the permitting of new infrastructure as well." The main elements of each Ampyx Power AWES are an automatic rigid-wing aircraft tethered to a ground-level cable-winch/generator unit, and, in the future, offshore landing platforms. When the aircraft moves outward away from the generator unit, it pulls the tether, driving the generator. Once the tether is reeled out to a maximum of around 750 metres, the aircraft automatically descends and the tether reels in. It then ascends again and repeats the process. "Power generation here is a discontinuous process," says van Hemert. "Each time the tether is fully reeled out, the dual-mode electric machine generator-mode stops and shifts to motor-mode for reeling in, and vice versa. Reeling in does not require much energy, but not generating power during these spells represents up to about a 20% yield loss compared with an ideal continuous power production situation." To tackle this issue, the firm’s engineers are considering two options. The first is a hydraulic transmission system with compressed nitrogen "buffer" storage, the second is to have multiple groups of aircraft working in different cycle phases in a way that makes cumulative power generation more smoothly. The aircraft takes off from, flies and lands again on the platform completely automatically. It generates power, lands when necessary, guides itself back to launch position and relaunches when the wind picks up, all without the need for human interaction. This is made possible by utilising a vast array of sensors that provide the autopilot with critical information to perform safely. "Aircraft takeoff is enabled by two lightweight battery-powered electric motors," says van Hemert. "Active propulsion capability within our aircraft is regarded positively by the European Aviation Safety Authority both for flight safety and flight emergency situation compliance." The first three generations of prototype — AP0 to AP2 — all fly a regular crosswind, figure-eight pattern at 250-500-metre altitudes. This kite-derived principle might be applied again for the 150kW AP3 model that will be ready by the end of this year, with testing and validation starting early in 2019. "Our aircraft fly at 70m/s, and flying steep upward loops with gradual descends offers maximum use of the available power zones. It is also regarded as the safest," says van Hemert. "But flying figure-eight patterns becomes increasingly difficult as the aircraft gets bigger, because it has to take sharper loops within the same available vertical space, putting even higher demands on the flight-control system. We are therefore considering flying an alternative corkscrew-type spiral for the AP4." The company lab contains the AP0 and AP1 aircraft, and on a large table rests one of the two AP2 prototypes. Each time one is field-tested, the other is updated with the latest sensors, software modifications, and other optimising solutions. Another test display shows one of the AP3’s four landing-gear units, complete with suspension, which is crucial for faultless landing. Another display demonstrates the testing and optimising of the complex tether solution. Van Hemert shows a 9-10mm ultra-strong, lightweight DSM Dyneema cable for the AP3, and a much thicker (around 35mm diameter) cable for the AP4. "To minimise non-producing time, we could opt for faster reeling in, but this accelerates cable wear and is the single largest O&M expense. It is therefore an LCOE trade-off. The AP3 is a twin-body aircraft because this allows attaching the tether exactly at the centre of gravity, and its four wheels enable a more stable landing on a moving offshore platform." The floating launch-and-land platform for the AP4 will be around 20 metres wide and 30 metres long. When the aircraft lands, the tether is tensioned to slow it to zero speed roughly one metre above the platform. The aircraft then drops on to the deck, where it is firmly stowed until the next flight. The AP4 floater design consists of a three-column semi-submersible structure with 1,259 tonnes free-floating water displacement, and a structural mass of 491 tonnes. The un-ballasted draught is 11 metres — 16 metres when ballasted — allowing easy onshore assembly and sea towing. The catenary mooring system uses drag embedment anchors with a 500-metre footprint radius. A flexible inter-array cable links each floater to an offshore high-voltage station. "Because the structure lacks aerodynamic damping during operation like with wind turbine floaters, stability was optimised through a fully closed bottom heavy plate with drag-enhancing welded ribs," says van Hemert. "The wave tank test found that short waves are dampened well, and that the aircraft could adapt to long waves when landing. We are optimistic about the potential to further optimise the design and reduce costs. "Another finding was that it is the survival conditions of the platform that are driving the design, not the structural mass or forces introduced by the AWES. Future aircraft scaling will therefore have little impact on the size and cost of the floater, with favourable effects on Capex and the levelised cost of energy (LCoE)." Van Hemert expects to complete the AP4 prototype by 2023, and commission the first pre-series models in 2028. "By then we should have at least one project with AP3 turbines in operation, while 2MW for far-offshore will only be an intermediate steps towards 4MW and beyond. The main uncertainties in our current LCoE calculations are costs, lifetime and performance of AP4 components. More detailed LCoE calculations can only be performed when the design has progressed further." Ampyx Power was set up in 2008 as an offspring business of Delft University of Technology. The founders initially worked on kite systems, but decided the rigid-wing approach offered more potential. The company employs 45 staff, most of whom are aerospace engineers and scientists, concentrating on the developing and testing of aircraft and auxiliary items. It entered into a close cooperation with German utility E.on, which provides its new airborne wind test field in Ireland free of charge. There are three main airborne wind-energy technology development directions. Two involve either a kite, or in Ampyx Power’s case, an aircraft, linked to ground-based cable-drum generator assembly via a retractable tether. The third is an aircraft fitted with wing-mounted turbine generators with a combined tether/electric power transport cable. US-based Makani leads the size ranks with a 600kW eight-turbine aircraft. Can quirky wind designs become mainstream?